Marianne Bjørnmyr is a Norwegian artist, living and working in Bodø, Norway. Marianne previously lived in London where she received her MA in Photography from London College of Communication in 2012. In her practice she works with research based photography, concerned around our perception of the photograph’s approach to reality, where the presentation of the photograph is set up against our understanding, interpretation and generated perception of imagery. The work ‘Your Penumbra’ examines photography, astronomy and distance. The work is based on a happening in 1880 where the young amateur astronomer Henry Draper was the first to photograph the Orion Nebula after spending decades refining his photographic technique and his self built telescopes. For the first time, the photograph displayed something that could not be seen with the naked eye. 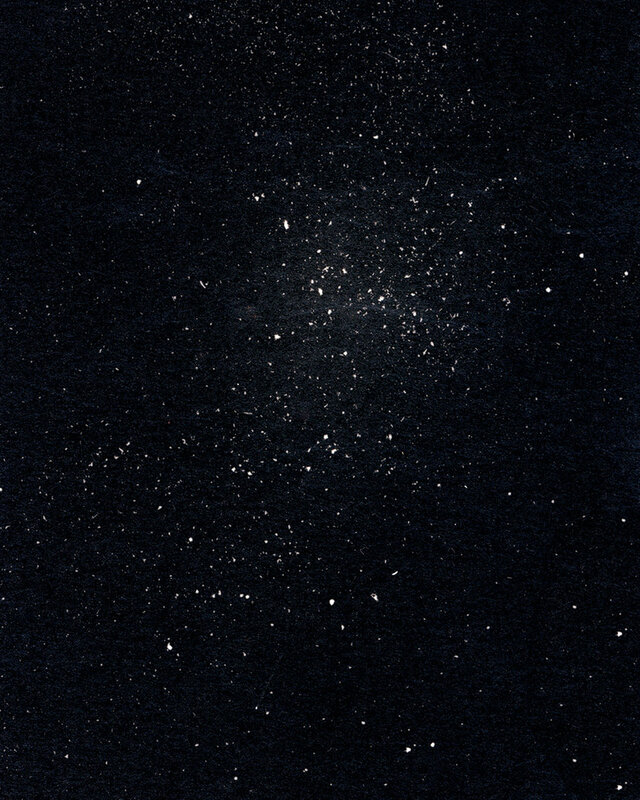 ‘Your Penumbra’ presents hand printed photograms: a starry sky, hints of nebulas and empty space. The photograms have been created by placing real star dust onto photographic paper before developing it in the darkroom. The images presents them selves as photographs of stars, and hints towards a disturbing contradiction. "I actually started the project in 2015 at Fathom residency at Four Corners in London. It was a six month residency, where I worked with the photograms, photographic sculptures and a 16mm video. I took a starting point into Henry Drapers photographs, and was really fascinated by photography as depiction of something so far away that it could not be seen with out eyes. I pretty much spent the six months of the residency experimenting for the photograms. I ordered the star dust from Germany, and it comes in tiny glass containers, so I had to work carefully too. I started with small images which I experimented with for ages. But the largest prints are 180x100 cm, and that was the most challenging part. Not only did I have to make the images "blind", it was also quite challenging developing, fixing and washing the prints, and not much room for errors. I was lucky to be able to use the darkroom at Four Corners with its large space, and had to build special throughs and iron frames for dev and wash."